Bonjour. Tout d'abord, je m'excuse - je ne parle pas français, je réside en Nouvelle-Zélande et je parle anglais. J'ai édité un ou deux articles wiki de casiopeia.net pour fx-9750G + et GII. J'ai également créé un programme (http://www.casiopeia.net/forum/downloads.php?view=detail&df_id=152 (nom est GROCERY)) et j'essaie d'utiliser BIDE pour éditer mon programme. Les codes d'échappement HTML ne sont pas nécessaires ici. Veuillez répondre en anglais si vous le pouvez, ma compréhension française est minime. Looks like Zezombye's method of detecting opcodes does not always heed for word boundaries. In this case, or is a synonym for the bitwise OR operation. Re may be the real part function - not sure here. Maybe some missing \b in regexes? It is not a problem with BIDE, but with FA-124. The opcode "&bitwiseor;" is represented on the calculator as "or", which is the same visually as the characters 'o' and 'r'. I assume you edited your program with FA-124's editor. When you typed "or", it had no way of knowing whether you meant the opcode "bitwise or", or the characters 'o' and 'r'. To prevent syntax errors, it assumed it was the opcode. BIDE prevents that by converting "or" to "&bitwiseor;" so that there are no conflicts, and it knows whether you mean the opcode or the characters. Same for &e_reg;. - Or leave it like that, since it's still displayed the same on the calculator. 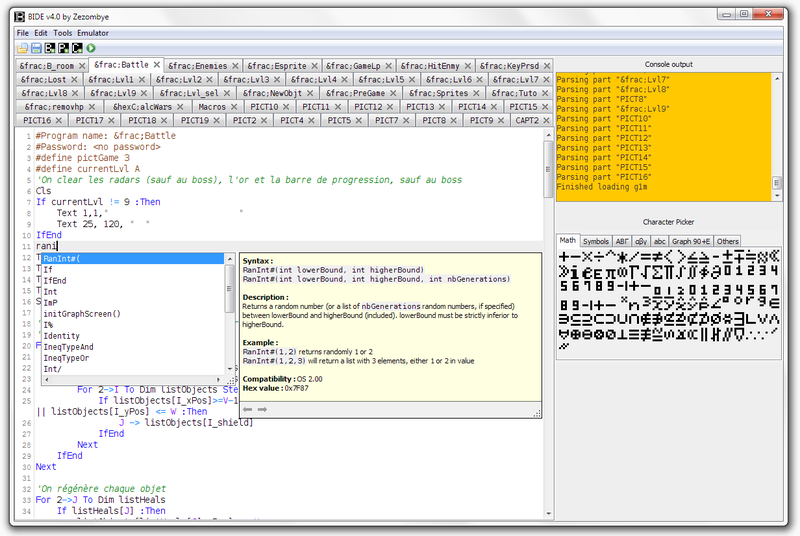 Lephenixnoir : I don't use regexes, since I don't need them. 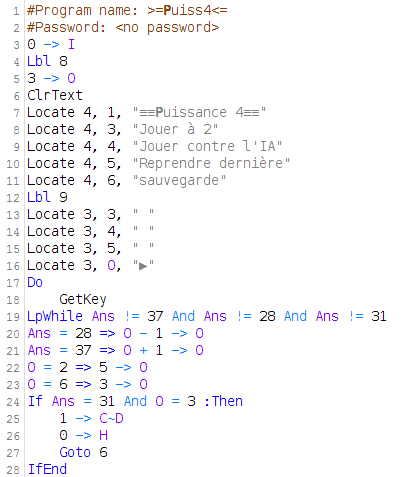 I simply convert each opcode to ascii. However I don't see why the R was edited out, should be R&e_reg;trieves. The real function is actually ReP so it's not because of that. I copied my program from my 9750G+ by typing it manually into the new calculator (9750-GII), and then copied it to the computer (FA-124) so that's entirely probable. I had some issues with earlier versions of my program triggering one or two issues with text strings when I re-uploaded it back to the 9750-GII. I simply rewrote the text strings so it didn't include "sensitive" text, and that seems to have fixed the FA-124 issues in the main. I brought up the BIDE issue because the BIDE editor is the first time I've actually seen the issue turn up since I corrected strings. Incidentally, when I first created the program on the G+, I made use of certain words just so I could get lowercase, as the G+ doesn't allow you to use lowercase otherwise. With the GII, I don't need to do this any more. Can I not simply type the correct strings into the editor window and then save the file back? Or would the strings get re-munged back into &esc; form as soon as it hit the FA-124 (which I would have to use to put files back onto the calculator)? I think you actually have to edit the program with FA-124, if you just transfer the g1m it won't change the content. I opened up the relevant G2M with a hex editor and tried modifying values back to ASCII. The second time I tried opening it in FA-124, the program gave "Application Error!" and I lost the relevant G2M contents. Yay. Thankfully I only lost the computer copy, not the calculator copy. So I've made a new G2M from the calculator contents on the computer. Sigh. Editing the program with FA-124 simply shows me the individual letters, not the saved-back text which (presumably) gets re-encoded once it gets to the calculator. Now I'm a bit puzzled why it all failed. Does the G2M have some checksum that failed? The G2M indeed has a checksum - you should've edited it with BIDE (that's what it's for, after all). 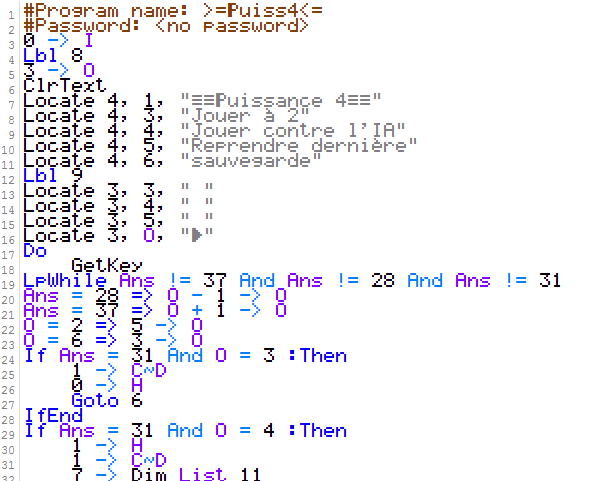 Editing the program with FA-124 shows you the individual letters because FA-124 shows the opcode "or" as "or", while BIDE shows it as "&bitwise_or;". There isn't any checksum in the G2M format. All there is is a file size field in the overall header (first 32 bytes, which is obfuscated using simple bitwise NOT). Here's the structure of the overall header, called "StandardHeader" by the community. Technically it isn't a checksum, however there are control bytes. Comment on fait pour executer et tester ce que on a ecrit ?